Now that the hot summer months are long behind us, it’s time to start thinking about where to huddle indoors and watch all our favorite fall sports. Luckily, you have your pick of the litter in terms of watering holes to enjoy the action downtown. Nashville casts a wide net of places equipped with enough screens to pass as a space station control center, and most offer some pretty great food and drink options to keep you satiated for hours on end. Continue reading below to see which spots we're recommending this season, and get busy cheering on your team(s) today! Located on Broadway just steps from Bridgestone Arena, Bailey’s has long been a prime spot for enjoying sports any day or night of the week. Their extensive draft beer and specialty drink list ensures you will always have something new to try, even if the Preds' game goes into overtime. And with plates like the Drunken Chicken Tenders and Fire Bites, you can enjoy all the best live sports on a full and satisfied stomach. No matter who you’re rooting for, their vast selection of gameday broadcasts will guarantee you can always catch your team on the big screen. Since its founding in 2010, City Tap House has become a much-frequented spot for the denizens of the very hip SoBro neighborhood (and proud graduates of Notre Dame). City Tap House is a fantastic spot to take in any sporting event no matter what time of year. Their friendly and knowledgeable waitstaff will find whatever game you're looking for and make sure your drinks are full for the duration! And with bottomless mimosas that won’t break the bank and complimentary parking on weekends, you and your friends can party down affordably. What are you waiting for? Broadway Brewhouse has televisions in literally every direction so you can enjoy whatever sport you came to watch no matter the table you’re at. And if you find yourself getting thirsty along the way, their signature Bushwacker (a creamy frozen cocktail infused with rum) will quench your thirst. It’s also one of the few places downtown that doesn’t feature live music, so if you’re there to watch sports and hang with your friends, you need not fear any three-piece band will start setting up during halftime. And with a menu that boasts everything from hot wings to jerk chicken to po’ boys your taste buds will be the biggest winners at the end of the day. 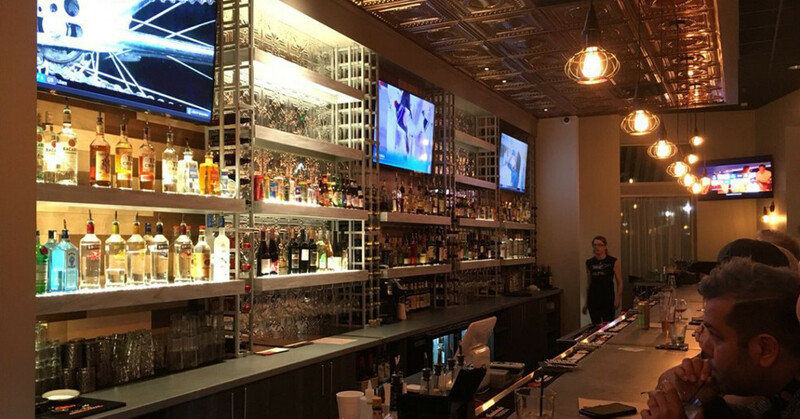 Situated directly across the street from the famous Wildhorse Saloon, Benchmark has become a haven for cheesehead expats who love cheering on their hometown team, the Green Bay Packers. If you find yourself with an appetite, they feature awesome plates such as Jamie’s Melt Down or the Memphis Rib Sandwich. Plus their outdoor patio provides all the breeze you need as the weather turns cool and the leaves begin to change. With a wide drink selection that includes several signature concoctions and an assortment of craft brews, you won’t be disappointed with any game day offerings. A stone’s throw from Bridgestone Arena and just a hop, skip, and a jump from Nissan Stadium, Barlines sets itself apart in downtown Nashville as the premier spot to party pre- or post-game! And for all those other times you’re not cheering on the Preds or the Titans, Barlines will gladly switch any of their 22 jumbo, flat screen HDTVs to whichever team you happen to be cheering for. Don’t wait any longer to discover this “honky-tonk” treasure at the Omni Hotel. Join the whole crew from 102.5, The Game, each and every Sunday this football season at Nashville Underground for a live broadcast of NFL Football Sundays. And for all those other days of the week, what’s not to love about consuming all your favorite sports in a place that features the highest and largest double-deck, multi-level, rooftop on Broadway? Make a reservation or drop in any day during the week for bar bites, hot chicken, Mama Lynne’s Truffle Mac & Cheese, and more! With 90 craft beers (yes, 90), amazing burgers, and simple pub food, M.L. Rose is a great spot for posting up during any game time. Stop by on the weekends for 2-for-1 brunch drinks, including select cocktails, or knock off work early during the week for their happy hour and take a dollar off any appetizer, wine, liquor, or beer. Play any number of bar games in Martin’s Bar-B-Que backyard beer garden as you kick back, relax, and enjoy the game with your friends. Located in the heart of downtown, just a short walk from both Music City Center and Lower Broadway, Martin’s won’t disappoint in offering the best atmosphere for sports consumption. Make it a point to drop by the next time you’re craving a nice barbeque spread to go along with those touchdowns and shootouts. Watch any game, any time at Headquarters Beercade located down by the riverfront on 2nd Avenue South. Originally founded in Chicago, the HQ Beercade opened its doors in Nashville back in 2015 and prides itself on creating a welcoming atmosphere that is both unpretentious and approachable. Be sure to ask about their exclusive game-day menu, then try to beat that high score on any number of pinball machines or other retro arcade games during halftime or postgame! Located just down the street from First Tennessee Park, Pastime is an excellent spot to camp out on gameday. Whether you’re cheering on the neighboring Nashville Sounds in the summertime or want to cheer on the Preds or Titans in the fall, Pastime has several televisions on hand so you won’t ever miss a play. Take full advantage of their indoor-outdoor deck, full rooftop bar, and a variety of signature drinks! Branded as a real world “Cheers” style restaurant where they want to know your name, Neighbors prides itself on offering friendly service and dog-friendly patios. Neighbors is a full-service bar and advertises cheap specials so you don’t have to break the bank when your game goes into overtime. It’s also worth noting that they’re the exclusive seller of those hilarious “I’m a Predneck” T-shirts. Pick one up today! Known primarily as a hangout for expat Pittsburgh Steelers fans, Piranha’s is a fun place to hang with friends regardless of team affiliation. They also make their space available to rent out for large-scale events or viewing parties. With a kitchen that’s open as late as the bar itself and a happy hour during the week that boasts three dollar well drinks, Piranha’s will leave a lasting impact on any patron, native or tourist. Oh, and be sure to order the donut burger. Acme Feed & Seed is the place to go if you’re looking for a bar with that elusive historic charm that features expansive vistas of the Cumberland, Nissan Stadium, and Riverfront Park. Catch any game you want at the bar and then head up to the rooftop to enjoy a cool breeze. And if you do find yourself there on a Friday or Saturday night, be sure to bust some moves during their DJ Dance Party! Acme also features live music and is available to be rented out for whatever kind of party you’re throwing together.